I have been using Himalaya Herbal Neem Face Wash and Neem Face Pack since my graduation. They are the best skincare products for people with oily, acne prone skin. Now I am wondering how I missed trying their purifying neem scrub. Neem is a boon for people suffering from pimples and acne. 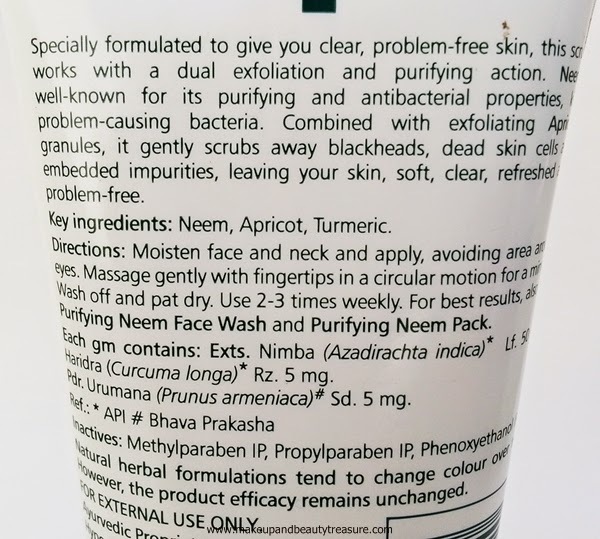 Today I am going to review Himalaya Herbals Purifying Neem Scrub* Rs 130 (Buy online). 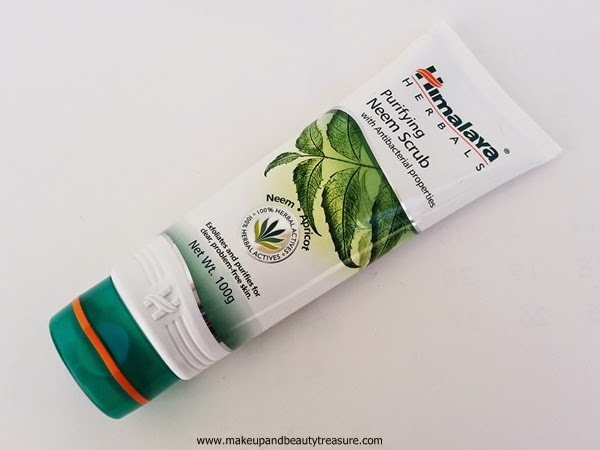 Himalaya Herbals Purifying Neem Scrub comes in a sturdy, white squeezable plastic tube with a green flip top lid. The packaging is quite simple yet soothing to look at. It can be easily carried around in a bag without any fear of leakage or spillage. The scrub has creamy color with neem powder and apricot kernels as granules. The scent is quite mild and pleasant. The texture of the face scrub is soft and smooth with creamy consistency. 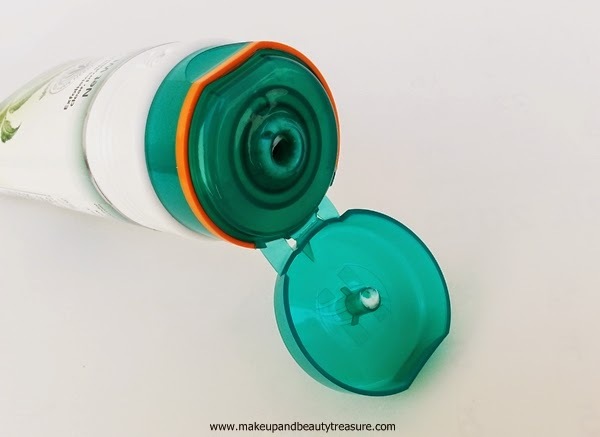 The scrub is easily dispensed through a small hole in the tube. As soon as the scrub is dispensed out, you are greeted with a refreshing neem scent. It is indeed pleasurable to use. 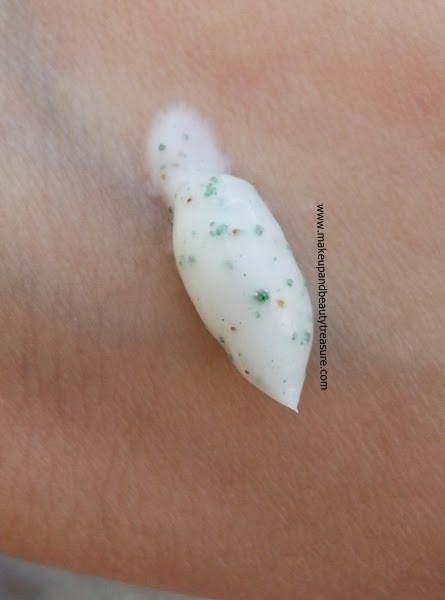 I first cleanse my face using a face wash and then gently massage the scrub onto my slightly wet face in small circular motions for a minute or so. Make sure not to scrub roughly or too close to the eye area. It spreads effortlessly across my skin unlike other scrubs. The neem and apricot granules do feel gritty though not abrasive and seem effective on the skin. They do give me a tingling with first usage but everything went normal from second usage and onwards. The scrub is easily rinsed away with warm water (I make sure to splash cold water after warm water to close pores!) with no greasy or sticky feeling. I then follow it up with a face pack. My skin feels soft, smooth, clean and thoroughly exfoliated. It is very effective in exfoliating the dead skin and makes my skin soft and visibly brighter and smoother. I have dry skin but I don’t feel the immediate need to moisturize my skin. I used it when my skin turned oily and it worked well in removing all dirt and oil from pores. The scrub is meant for all skin types. With regular usage, I feel it makes skin even and gives healthy glow to it. I haven’t faced any adverse effects such as irritation, redness or breakouts whilst using this scrub. I have few pimples on my cheeks but this scrub does not aggravate them. I love using it twice a week. It contains all good ingredients like neem, apricot and turmeric that are good for making skin clean and clear. I feel with regular usage it does help in controlling and preventing pimples form occurring. It claims to remove blackheads but I could not speak of my experience with it as I do not suffer from blackheads. Himalaya Herbals Purifying Neem Scrub is a great face scrub to keep skin soft, smooth and clear. It exfoliates skin effectively giving a healthy glow to it. It contains neem and apricot granules that are really good for treating problematic skin. It does not aggravate acne and pimples and makes skin radiant with regular usage. I would definitely recommend it to everyone! 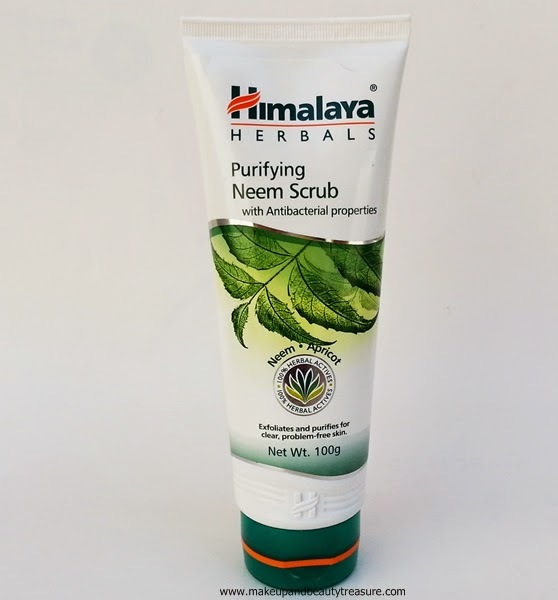 Have you tried Himalaya Herbals Purifying Neem Scrub? What is your favorite face scrub? Share in the comments section below!